In the old Mighty Morphin’ Power Rangers TV show, the spandex-suited heroes fought many bizarre creations: a time-traveling cactus, a rapping upside-down jack-o’-lantern, a pineapple-octopus hybrid named Pineoctopus that could also take the form of a clown, and a killer clutch purse with a lipstick sidekick. In their big-screen reboot, they fight a big, lumbering goopy molten gold thing. Its name is Goldar, which was also the name of a villain on the TV show who looked like one of the Wicked Witch’s flying monkeys on steroids. This Goldar also has wings, but that’s about all it’s got going for it; the effects are ugly, so the monster looks less liquid metal and more Velveeta cheese. 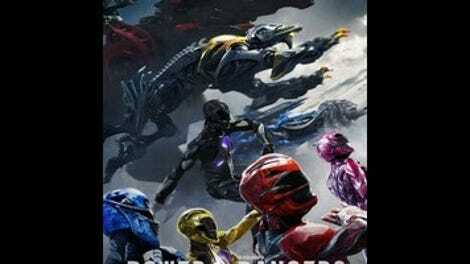 As for the Power Rangers, their suits look like they’re made out of bowling balls. They barely even get to wear them, and only in the last 20 minutes or so. Their thundering dino-mechanical “Zords” resemble rough renders of rejected Transformers, while their headquarters is a cheap knockoff of the dim Kryptonian spaceship from Man Of Steel. The Power Rangers-like parts of Power Rangers are bad enough to make one long for the goofy sight of rubber-suited Japanese stuntmen prancing around a rock quarry. Of course, the TV franchise (there have been almost two dozen Power Rangers series to date) got most of its effects, monster, and action footage from the Japanese series Super Sentai. It was a strange hybrid of the weirdness of Japanese children’s programming and the same type of vapid early ’90s American market testing that gave the world the Burger King Kids’ Club. 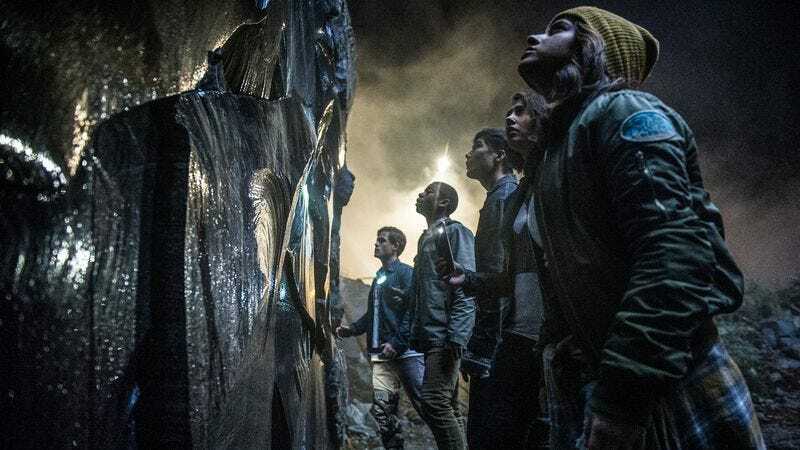 But the peculiar thing about the new Power Rangers movie is that it’s most successful in handling this lamest aspect of its source material: the teenage soap opera. Its version of the Rangers is a superpowered Breakfast Club that meets by way of weekend detention. Jason (Dacre Montgomery), the red Ranger and destined group leader, was the star of the Angel Grove High School football team before he got arrested while trying to prank their rivals; Billy (RJ Cyler of Me And Earl And The Dying Girl), the blue Ranger, is a misfit with an autism-spectrum disorder who accidentally blew up his own locker; Kimberly (Naomi Scott), the purple (formerly pink) Ranger, is a popular kid with a mean streak; Zack (Ludi Lin), the black Ranger, is the too-cool-for-school Judd Nelson type; and Trini (Becky G.), the yellow Ranger, is an underwritten character. The one part of the old TV aesthetic that has carried over to the new film is the rock quarry—always the anonymous, scraggly rock quarry. (Speaking of which, has anyone ever considered a crossover of Power Rangers and classic Doctor Who?) Something like half of Power Rangers is set in, around, or under the Angel Grove rock quarry, as this is where the new Rangers happen across the ancient alien medallions that will give them their powers and eventually lead them to the tutelage of Zordon (Bryan Cranston), an Oz-like floating head reimagined here as a wall-sized pin-screen toy. The intergalactic gobbledygook that should be the film’s bread and butter bears only perfunctory interest for director Dean Israelite (Project Almanac); his main concern is exaggerated teenage types getting into trouble and learning and mastering an assortment of superpowers. The climactic showdown between the Zord-piloting Rangers and their arch nemesis Rita Repulsa (Elizabeth Banks) is about as uninspired as these things get—but when it comes to the police chase that gets Jason in trouble, Israelite directs it as a continuous pan around the inside of a car, an homage to Steven Spielberg’s The Sugarland Express by way of digital compositing effects. This is the conundrum of Power Rangers: The closer it gets to fantasy spectacle, the less imaginative it becomes. Thanks to a better-than-average lead cast of near unknowns and Israelite’s fondness for zipping the camera down school hallways and across classrooms, the film works surprisingly well when it simply treats the Rangers as teens—something the original TV series could never do, because its stars all looked 30 and couldn’t act. Cyler and Lin both bring charisma to characters who could easily be one-note without ever compromising Billy’s asocial quirks or Zack’s tough-guy demeanor. (It’s also refreshing to see a movie that depicts a character who can’t read cues and a household that speaks a language other than English without making a big deal of either.) But when it comes time to morph and break out the Zords to the sound of “Go, Go, Power Rangers,” the film groans and shuffles, like a sulky teen who’s been told that they have to finish the dishes before they can borrow the minivan. Note: Power Rangers producer Haim Saban is also the chairman of Saban Capital Group, which is a part owner of Univision Communications, the parent company of Fusion Media Group, which owns The A.V. Club.